The question we’re supposed to answer here is “should you lease this car?” If you live where it’s available, you should absolutely go get a Clarity. The Honda Clarity fuel cell vehicle is a brand new design for 2017, and it’s the first of three different vehicles planned for the platform. The other two are a standard hybrid and a plug-in hybrid, and they are expected to be released later this year. Automakers have been talking about a hydrogen-electric car for decades, and various prototypes have been made and tested. 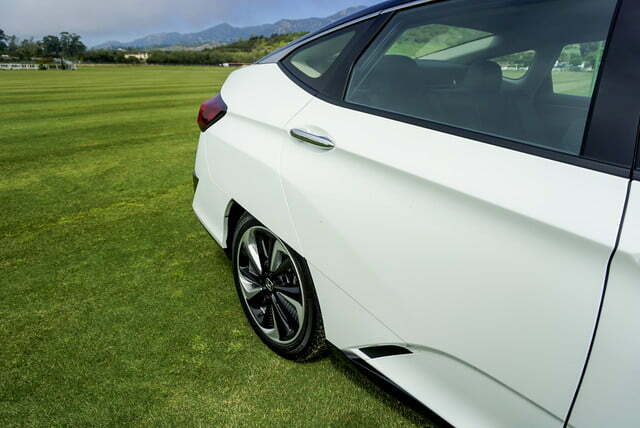 Toyota was first to market with their Mirai, and now Honda has delivered the Clarity. Honda conducted a prototype beta test a few years ago called the FCX Clarity, and the test went well enough that the Clarity is now in regular production. 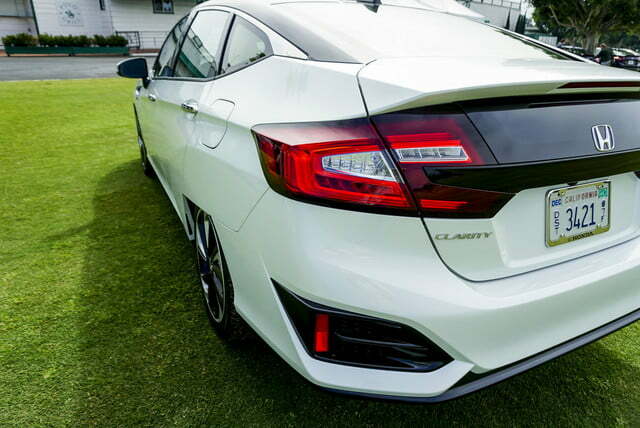 Honda produced the Clarity for a couple of reasons. 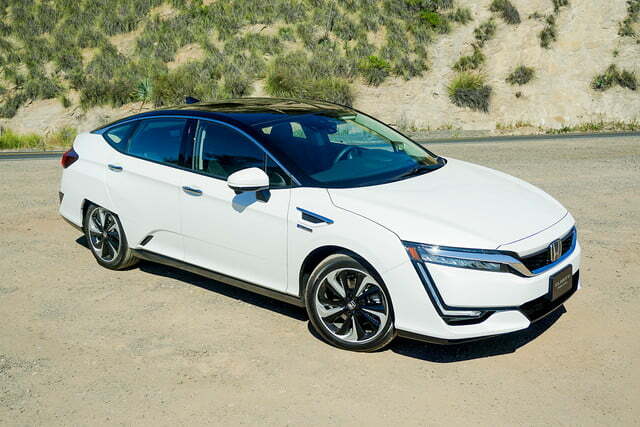 First, there’s strong political support to explore hydrogen as part of a general push toward clean power, and second, Honda wants to be a leader in basic automotive R&D. 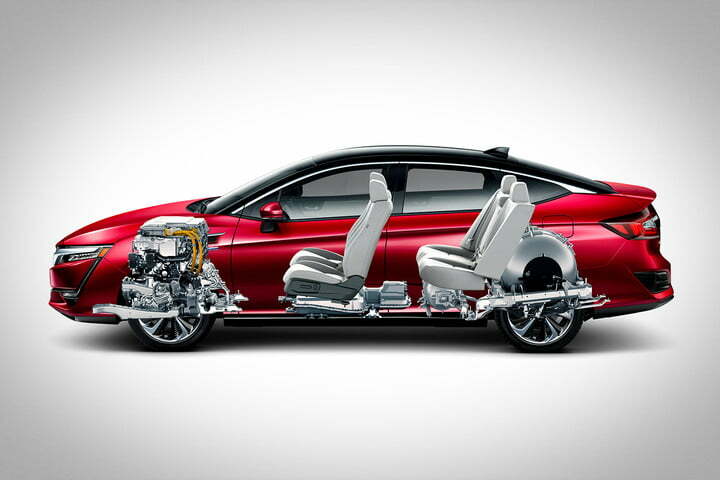 Honda has managed to make the Clarity’s interior futuristic, while at the same time useful and familiar. What you’ve got with the Clarity is a five-passenger sedan powered by a hydrogen fuel cell as described above. 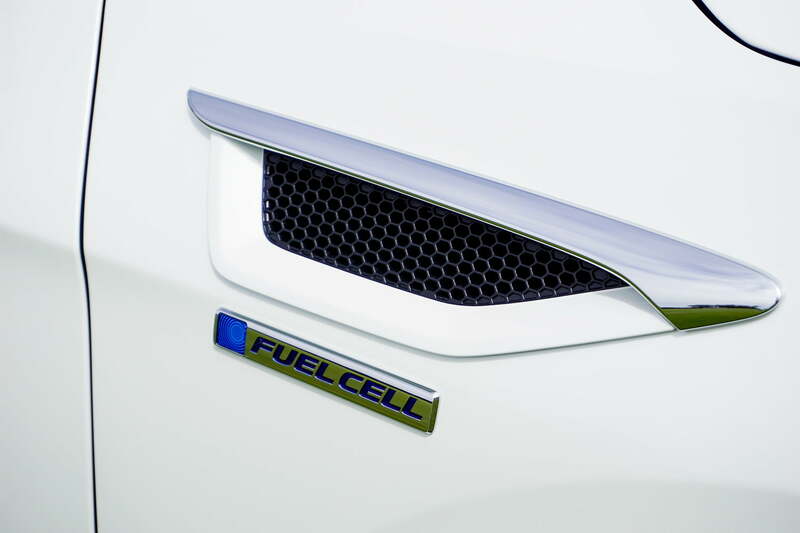 The fuel cell creates electricity that charges a battery and powers an electric motor. There’s no gasoline or internal combustion engine of any kind, and no charging cables or any need to worry about finding a charging station. 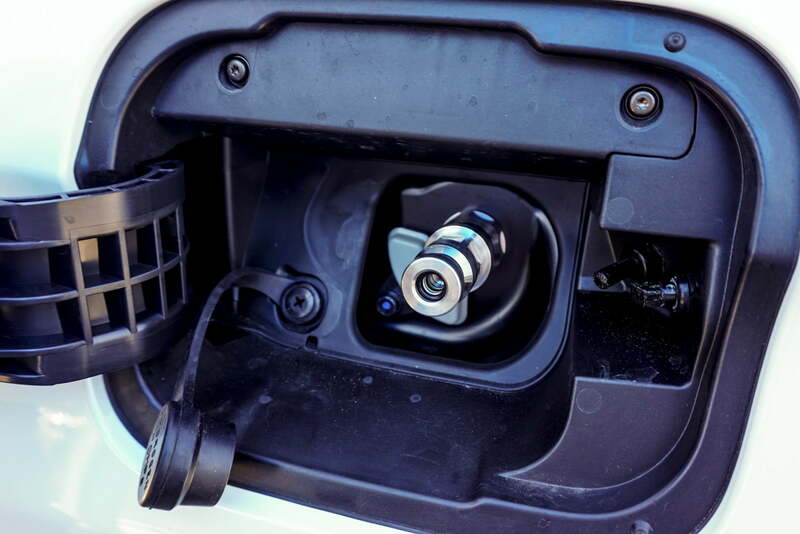 The Clarity is designed for urban and suburban commuters or families in areas with enough hydrogen infrastructure to make a fuel cell vehicle feasible. 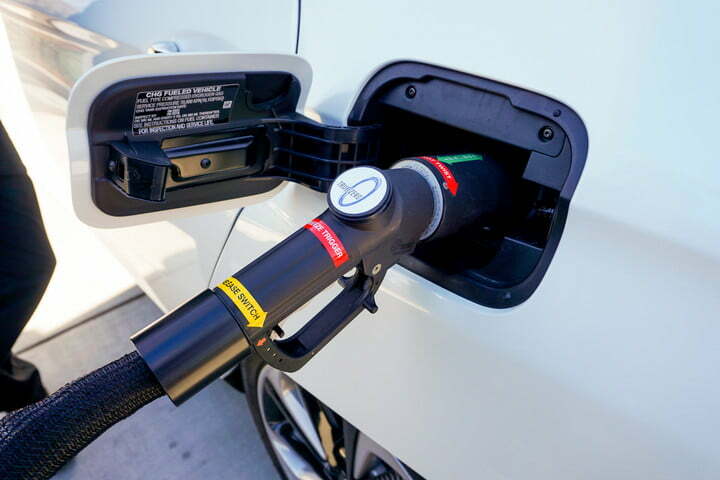 At the moment, that means the Clarity is available only in the Los Angeles and San Francisco areas, because that’s where the hydrogen stations are. The California Fuel Cell Partnership has a map here. You can check and see if you live and work close enough to a hydrogen station to make the Clarity feasible. There’s only one trim level for the Clarity, but it’s got a lot of features. If you compare it to an Accord, for example, you’d be looking at the top trim and package list. Later this year the Clarity platform will also be available as a completely electric vehicle, and as a plug-in hybrid with some kind of gasoline engine. Looking at the exterior, the Clarity is sure to evoke a reaction – for better or worse. 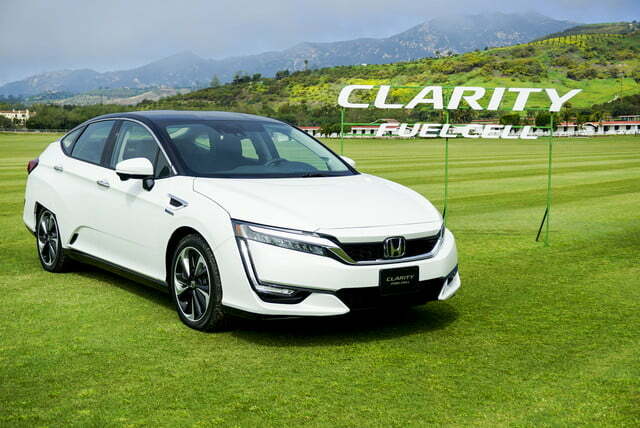 Honda went with the notion that alternative fuel vehicles should be visually distinct, and the Clarity is different enough to be identified at a distance. You may like it or you may not. That’s the risk with an unusual body style. The Clarity design pulls the rear wheels back to give you a larger passenger compartment, and the roofline slopes back all the way to the trunk for a four-door coupe look. The rear wheels are partially skirted by the fenders, and that’s also the widest part of the car. This treatment is partly for styling and partly for function. All four wheels use air ducts to create laminar airflow around the wheels in order to reduce drag. 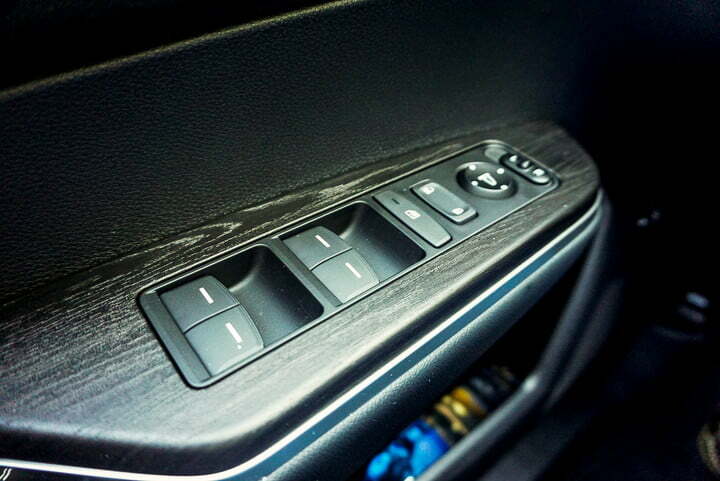 If you want to be noticed for driving a Clarity, that’s sure to happen. But most people will agree that the car is kind of funky looking. The Clarity has a nice tech package, with all the usual Honda refinements. There’s navigation, a good 540-watt sound system, and HondaLink smart phone integration, plus support for Apple CarPlay and Android Auto. The interface is essentially an 8-inch tablet mounted on the dashboard, but it works well and there’s nothing to complain about. You also get a really nice head-up display in the Clarity. 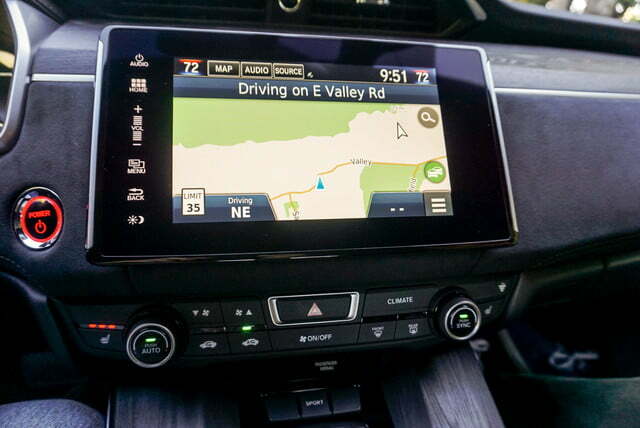 Honda also offers a HondaLink app for your phone that will allow you to monitor and control the Clarity, and it will direct you to the nearest hydrogen station. In Northern California, there are currently six stations in the Bay Area, one in Sacramento, and one in Truckee. In Southern California, you’ve got 16 stations in the Los Angeles area, plus one in Del Mar near San Diego and one in Santa Barbara. Note that about 20 new stations are coming online this year, so the refueling situation will be getting better as time goes on. 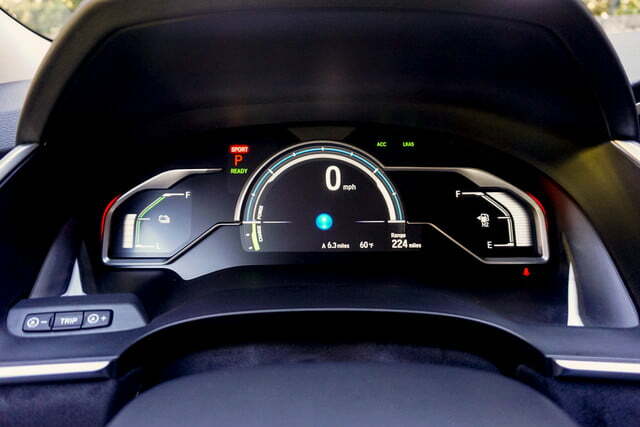 Honda has managed to make the Clarity’s interior futuristic, while at the same time useful and familiar. The controls are well laid-out and easy to understand. The touch surfaces use “Ultrasuede” covering that’s made from recycled material. 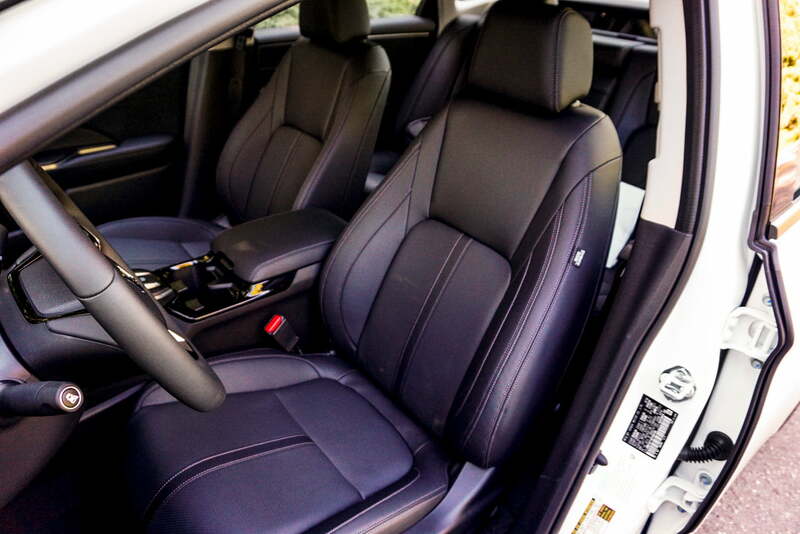 The simulated leather upholstery is something called “Prime Smooth” that is derived from plant matter. Up on the dash, there’s some simulated open grain wood trim. 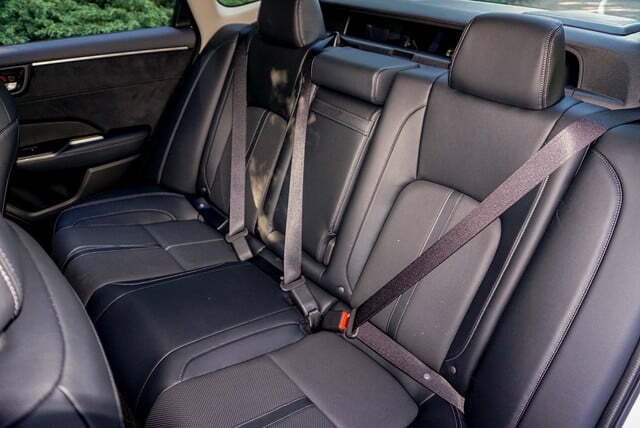 If ersatz green materials don’t bother you, the seats are comfortable and supportive. They’re fully adjustable and heated. What you’re going to perceive overall with the Clarity is a comfortable, high-quality, and spacious interior. There’s ample room for five adult passengers, and you wont be knocking elbows in the front seats. There’s plenty of legroom, too. About the only place where there’s less space than you might expect is in the trunk, because some of the cargo space is taken up with the larger of the Clarity’s two hydrogen tanks. You’ll be able to get a couple of suitcases or golf bags in there, but it’s not the cavern you usually get with a mid-size sedan. The driving experience with the Clarity is enjoyable. The Clarity is most likely to be used as a commute and family vehicle, and it will excel at those purposes. The Clarity is available only in the Los Angeles and San Francisco areas, because that’s where the hydrogen stations are. 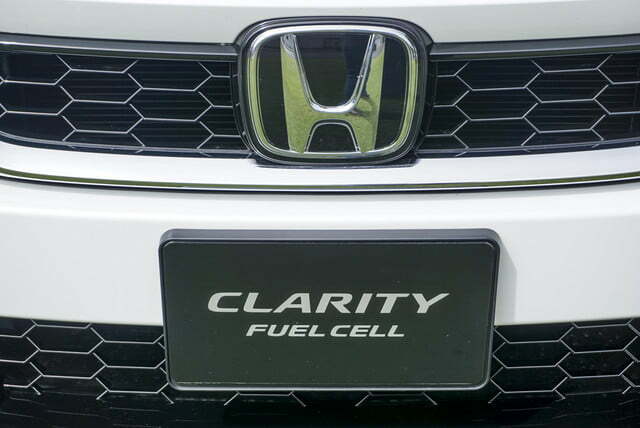 For the record, the Clarity has a combined rating of 68 MPGe. But that number is even less meaningful than usual with electric vehicles. What you care about is the EPA-estimated range of 366 miles on a tank of hydrogen. We saw a somewhat shorter range of about 260 miles, but we were testing the car on unusual conditions like uphill acceleration and generally not attempting to save energy. Honda’s electric motor is very effective, providing 174 horsepower and 221 pound-feet of torque with a 13,000 rpm redline. The best part is that you get the full 221 pound-feet of grunt starting at zero rpm, and it doesn’t start to drop off till about 4,000 rpm. The horsepower curve shoots up like a rocket to about 5,000 RPM and then stays flat to 10,000 rpm. The effect under your right foot is that the Clarity offers great acceleration from a stop, and very good 60-80 passing power on the freeway. Your top speed is governed to 103 mph. The Clarity uses front and rear McPherson strut suspension, and delivers a smooth, quiet ride. The Clarity also has an unusually long wheelbase – you’ll notice that in the photos. The long wheelbase makes the Clarity stable on the highway. Because the battery and the electric motor are mounted low in the chassis, the center of gravity is low as well. As with all electrics, the main noise you hear is road and tire sound. The Clarity has not yet been rated by NHTSA or the IIHS. But this car does not sacrifice safety in any way to get its green credentials. 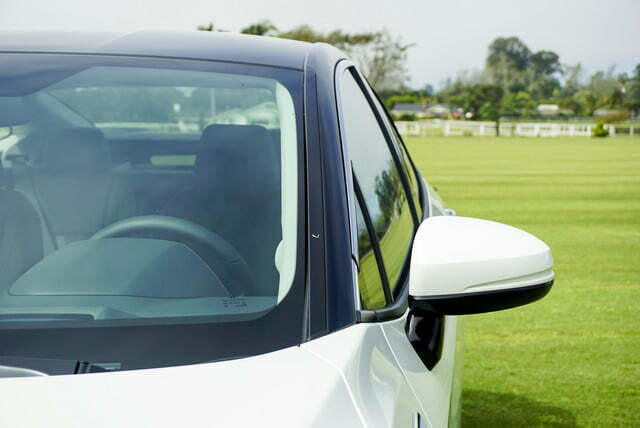 All the safety gear that you want in a modern car is there, including blind spot monitoring, lane keeping assist, forward emergency braking, and so on. The Honda Sensing system uses cameras and millimeter-wave radar to predict and mitigate collisions. Finally, Honda’s innovative LaneWatch will put the right-side blind spot view on the center display when your right turn signal is actuated, and that’s a great feature every car should have. But basic crash safety is not the issue that worries people with a hydrogen car. People tend to think of hydrogen as a dangerously explosive gas. So let’s address the Hindenburg in the room. The fact is, there’s a lot more danger in a tank of gasoline than in a tank of hydrogen, especially in a crash. The Clarity’s hydrogen tanks are made of aluminum wrapped in carbon fiber wrapped in fiberglass. If an impact is detected at the bumpers, a valve closes and the flow of hydrogen is cut off, and any hydrogen in the system is vented to the atmosphere. Finally, the tanks are mounted in the center of the vehicle, protected from impacts. The hydrogen refueling process is far safer than using a gas pump. The hydrogen pump uses a positive locking and sealing mechanism, so you won’t be spilling hydrogen at the refueling station. Using the pump is easy and takes no longer than filling a gas tank. 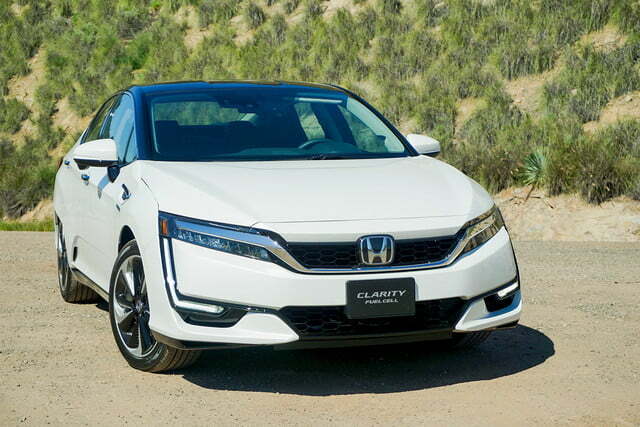 How would you like to drive the Honda Clarity for three years absolutely free of charge? Because that’s essentially what Honda is offering you. Right now the Clarity is a lease-only vehicle. It does have a price, but you can’t buy it. The numbers pencil out like this – Honda will lease you the Clarity for 36 months for $2,848 down and $369 a month. That’s $16,132 out of your pocket. 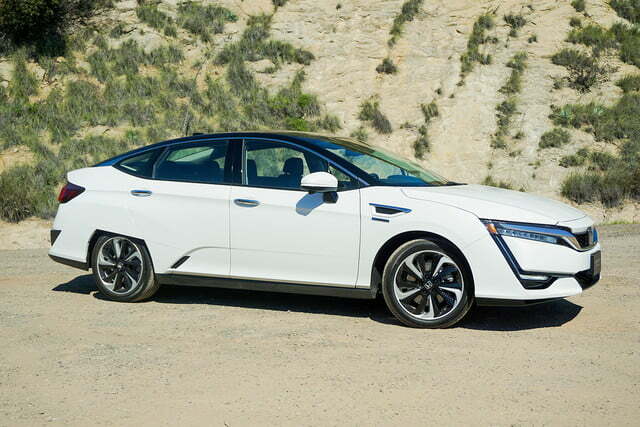 But Honda will also buy your first $15,000 worth of hydrogen at the available stations in California. A complete refill costs about $90, so that’s about 167 fill-ups, and at the EPA-estimated 366 mile range per tank, that’s over 60,000 miles. It’s not a coincidence that the lease comes with a 60,000-mile limit. Your net cost is already down to $1,132 to drive the Clarity for three years. 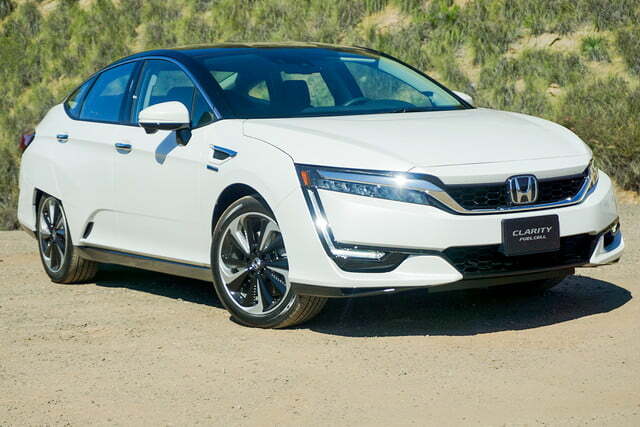 If you live or work near a hydrogen station, the arithmetic alone makes the Honda Clarity a no-brainer. 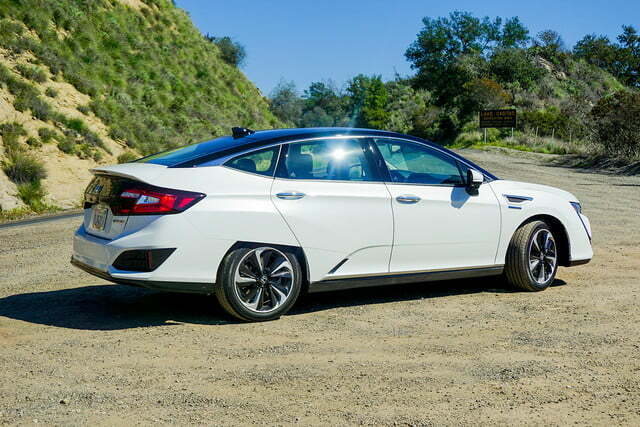 But then on top of Honda’s deal, the State of California will give you a $5,000 tax credit for driving the Clarity, which leaves you almost $4,000 to pay for insurance, tires, and any maintenance costs. California will also let you drive in the HOV lane and use the toll roads for free. Honestly, I’m surprised this car doesn’t come with a set of steak knives. If you’re concerned that you’re limited to a relatively small geographical area with the Clarity, Honda is also providing 21 days of luxury car rental for you during your lease period in case you have to make a road trip. 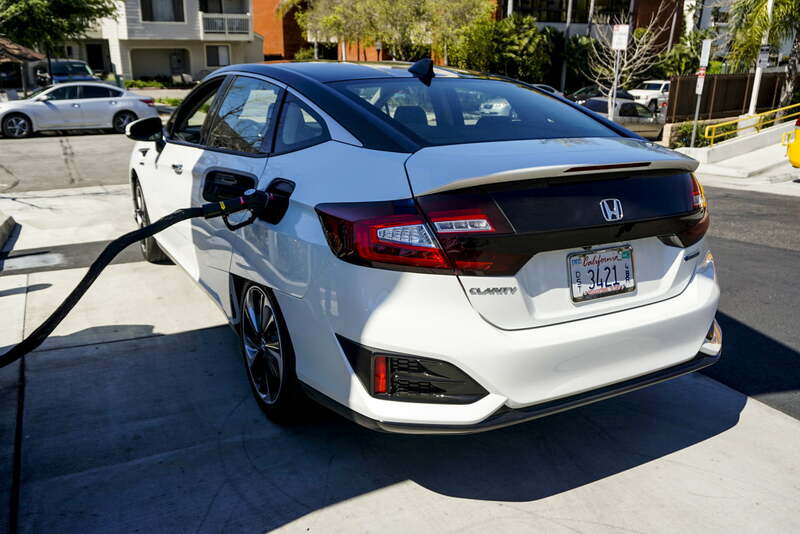 If you live or work near a hydrogen station, the arithmetic alone makes the Honda Clarity a no-brainer. This is a very nice commute vehicle that qualifies for HOV lanes and free use of toll roads, and you can get it for free – or maybe even better than free, once you factor in the money you’re not spending on gasoline. As an alternative, you could buy or lease the Toyota Mirai hydrogen fuel cell car. The Mirai also comes with $15,000 in hydrogen and the tax credit, plus it’s a little less to lease each month, so it’s also a good deal. However, the Mirai is not as refined or luxurious as the Clarity. All things being equal, the Clarity is a step ahead. As always, the bottom line is “should you lease this car?” If you live where it’s available, you should absolutely go get a Clarity today before they’re gone. It’s a good car with a great feature set, and free is an excellent price. What are you waiting for?